Pallet flow racking is a popular high-density warehouse storage solution that maximizes capacity and throughput. However, the fact that gravity is the main “driver” of the system the challenge of pallet flow is to make sure that the front pallet position is not just always filled but also that it can be safely picked. 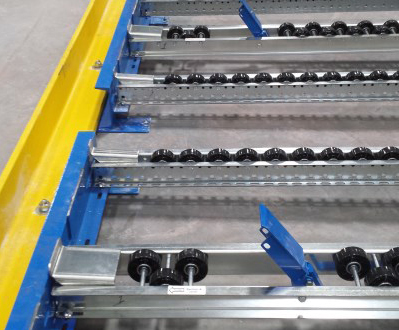 Pitch, lane configuration and wheel/roller assembly are essential design considerations but the pallet separator might also play a significant role in flow lane efficiency. 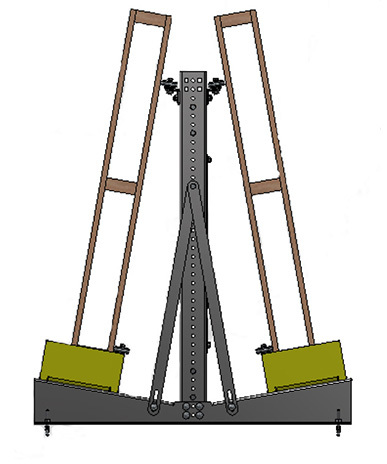 With the rear forces removed, the front pallet can be picked safely and easily. Now, not every pallet flow system or even lane is going to require pallet separators, so we thought we’d share the process of how we determine if they are required and how we select the type of pallet separator to use. Is this an existing flow system or new system? Existing pallet flow rack lane can be retrofit with pallet separators if needed. The Mallard sales & engineering team will review current drawings to determine the best method for attaching the separator to the rack structure keeping in mind that the addition of pallet separators can lengthen the lane requirement needed. How are the pallets being unloaded… by person or lift truck? The case pick and flex separator are both options for manual pallet extraction operations for case picking applications with easy to use foot operated release mechanisms. The forklift and layer pick separators are designed for truck extraction with an automatic separator reset that is triggered when the front pallet is removed for the rear pallets to advance. What type of lift truck or AGV (automatic guided vehicle) is used to load and extract the pallets? Specialized material handling equipment can be used with pallet separators, for example, the layer pick system uses a special forklift with a clamp or suction attachment to pick multiple layers in one pick and the layer pick separator was designed to work specifically with that system. Additionally, the forklift separator is designed for standard forklift pallet extraction. The pneumatic separator is another option to allow the fork truck operator to trigger the release from the vehicle. Are you using a pick module or the floor? The method for removing the pallets helps determine the type and necessity of the pallet separator. For example, the case-pick separator is simple to manually operate with a simple foot release and increases both safety and efficiency for case picking operations. For reserve storage at higher elevations we highly recommend pallet separators to allow for safer more efficient extraction where pallet lane sight-line is limited from below. What type of pallet is being used in the system? You know us, we always recommend GMA style pallets but if you are using something different they will need to be evaluated to determine their “flowability” in the lane. If the loaded pallets cause a burden on the front position then pallet separators would be recommended. What are the minimum, maximum and average pallet weights? Pallet separators control the combined rear pallet weight forces, so by using the formula above, you can determine the potential weight for proper lane configuration and to see if one or more separators are needed at all. What is the condition of the pallets? We are looking for good to excellent condition pallets for a consistent flow, so are there missing or broken boards, protruding nails, etc.? How many pallets deep is the system? Case-pick and layer pick pallet separators are good shallow depth options while flex and forklift separators are designed for deep-lane… and the dual pallet separator is for very deep-lane… so how deep will the system need to be to accommodate your needs? What is the depth available for the system? As mentioned briefly in Question 1, pallet separators add length to the lane so it will need to be determined if there is enough room for as deep a lane as you think you need. If it is a shallow depth but more positions are needed, the experts at Mallard can help rethink and reconfigure to accommodate your needs. Do you need pallet return lanes? The EPR-700 Series of pallet separators gives you two configurations for efficient, space-saving yet safe pallet return. The stacked empty pallet return allows for 5-6 pallets to accumulate before being released to flow back to the load side and the Single and double-sided vertical pallet Returns offer a narrow flow lane to collect and flow single pallets on their sides saving considerable footprint space. For more information on the Mallard pallet separator complete product line you can download our brochure and don’t forget we are here to help. Gravity flow experts are a phone call or email away, so just let us know what your warehousing storage challenge is and we’d be happy to guide you through the process.